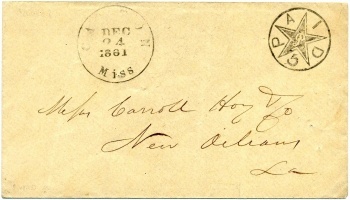 The first Confederate issue was placed in circulation in mid-October 1861, five months after postal service between the North and South ended. In the meantime, postmasters throughout the seceded states used temporary substitutes. These stamps are known to collectors as "Postmaster Provisionals", so-called because they were used "provisionally" until the first Confederate general issue appeared. In some circles, postmaster provisionals are referred to as "locals" since they were intended only for use from the town in which they were issued. Postmasters resorted to a variety of methods to solve their temporary problems, ranging from creating their own adhesive postage stamps to marking letters with rate-altered handstamps or simply marking the letters “Paid” in manuscript. When the new Confederate government was established in early February 1861, there was no Post Office Department. It was not until February 21, 1861 that the Post Office Department was established. This was followed by the appointment of John H. Reagan as Postmaster General on March 6. Quickly thereafter the organization of the Confederate Post Office Department began in earnest. Postmasters from the seceded states that joined the Confederacy found themselves in a very difficult position. While most postmasters were sympathetic to the South and intended to accept Confederate postmaster commissions, they were still under oath to the United States Post Office Department until June 1, 1861. The United States demanded a confirming oath from most Confederate postmasters before shipping additional supplies of U.S. stamps to them during the period between the formation of the Confederacy and June 1, 1861. Confederate Postmaster General John H. Reagan advised Southern postmasters that, in the interests of the people in both parts of the country, it was the wish of the Confederate government that all postmasters continue their duties, render their accounts, and pay all monies to the government of the United States until the Confederate Post Office Department could assume control over its own postal affairs. In a letter written by Reagan in 1898 in reply to some inquiries concerning Confederate postal matters, he explained the Confederate Post Office Department's official position relative to postmaster provisional stamps. 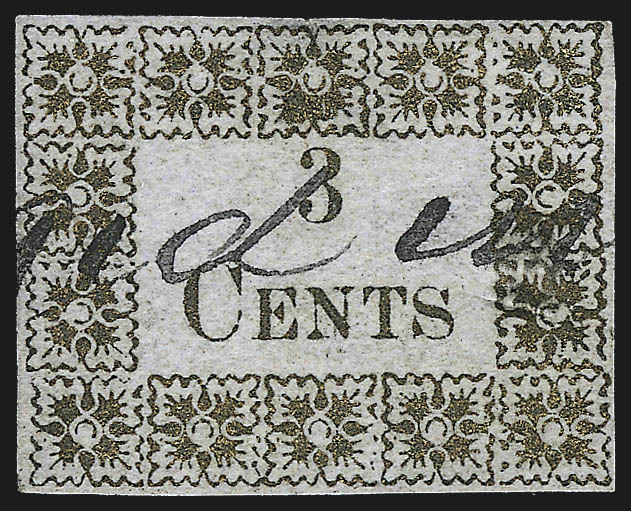 Some of the known 3¢ 1861 postmaster provisionals were adhesive and some were handstamped. All are rare except the 3¢ Nashville, which was prepared but never issued. Until adhesive stamps were provided by the Confederate government, some postmasters designed their own adhesive stamps for their towns. Some of these included the postmaster's name, the town of origin, the postage rate, and often an elaborate design. They were often printed at nearby newspaper or printing offices. On the other hand, occasionally the "stamp" was as crude as hand stamping “Paid” or a rate scribbled on small pieces of paper for use as adhesives. Some enterprising postmasters printed entire envelopes with the value imprinted directly on them, creating their own postal stationery, often printed at the local newspaper or a print shop with the appropriate new Confederate rates. They were produced in quantity, using envelopes procured by the postmaster. These were prepared in advance and sold over the counter as a convenience to local patrons. 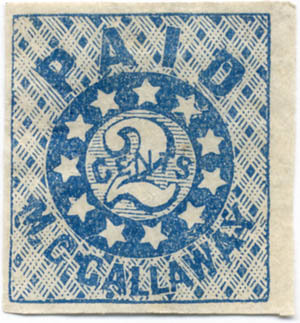 Many small towns were too small for such resources as printing their own adhesives or envelopes, thus some postmasters simply reverted to the pre-stamp period practice of stamping the word "Paid" with the appropriate rate on the envelope, a procedure made obsolete by the first issuance of stamps in 1847. A handstamped provisional envelope was prepared and sold in advance at the local post office with the rate marking and a "control" marking (security feature) which might be a second dated or undated postmark, different colored markings, special markings or even the postmaster's initials. When such an item was taken back to the post office to be mailed, it received a town date stamp. The control marking differentiates a handstamped provisional envelope from a simple stampless use. The existence of a postally unused example or use under a postally used general issue is normally considered prima facie evidence that the marking was applied in advance. In others cases, it may be more problematic. This is one of the most difficult area for collectors, even advanced students. Proving that a handstamped item was prepared in advance and sold over the counter is not always straightforward. What may seem "obvious" to some only generates questions for others. Each item must be judged on its own merits. If you suspect you may have an item prepared in advance, it is advisable to have it authenticated.